A brighter future is in your hands. We’re currently seeking an Enhancement Manager (EM). The Enhancement Manager (EM) schedules and directs personnel and resources towards providing quality, cost-effective enhancement services to clients. EMs also support the Account Manager(s) in estimating, design and client meetings as needed. EMs will also sell enhancement services to clients, with or without base maintenance contracts, on their own. The EM will oversee a commercial landscape portfolio and multiple service teams. The EM will be responsible for training and developing these individuals by providing day-to-day operational scheduling and guidance. 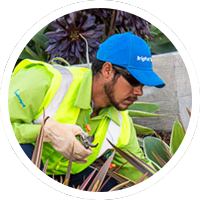 Manage all landscape enhancement services, including the coordination of all materials, people, equipment and subcontractors required to produce quality work. Inspect properties prior to scheduled service in order to properly prepare a specific action plan for service. Understand irrigation systems, identify necessary repairs or adjustments, and communicate recommendations to the appropriate party. After services, monitor all aspects of the landscape and identify insect or disease problems. Implement and enforce Brickman/ValleyCrest policies and procedures related to proper upkeep and maintenance, storage, use, and training required for branch equipment. Assist the Branch Manager in the performance of enhancement sales tasks as required.